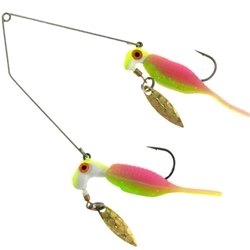 The Blakemore Road Runner Reality Shad Buffet Rig is perfect for Bass, Crappie, Spots and Smallies. The Reality Shad Buffet Rig is rigged and ready for action! Featuring the Pro 2.0 head, with prism eyes, scale pattern mold, and a brass willow blade. Measuring less than 3-3/4" long, it is the ultimate finesse presentation. Packed one rig per blister-card, top lure is 1/16oz and the bottom is 1/8oz. Cast or troll slowly and light line is best!